This is the fall pizza recipe that you have been looking for. A delicious combination of pumpkin spice, marshmallows, caramel and pecans. 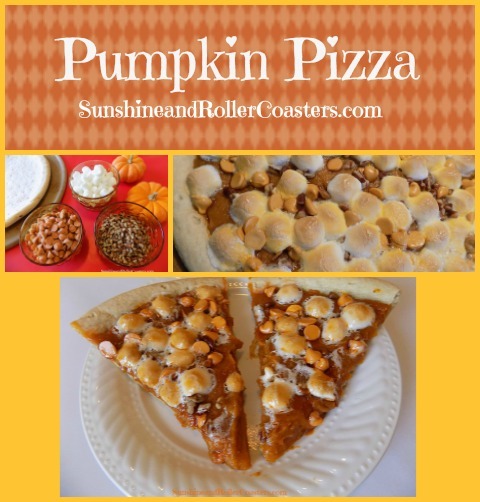 It’s the perfect combination of sweet and salty with that pumpkin spice flavor that you are craving this time of year. 1. Prepare pizza crust as per directions on the package or make your own. 2. In a mixing bowl combine pumpkin puree, heavy cream, Splenda, and pumpkin pie spice. 3. Spread pumpkin mixture on the pizza crust. 4. Top with mini marshmallows, caramel chips, and chopped pecans. 5. Bake at 350 for 20 minutes or until crust is fully baked and marshmallows are lightly toasted. ← Hallmark Channel’s Countdown To Christmas Starts October 27th!